How do I promote specific carriers and products in my quote results? Quote Promotions allow you to set carriers and products to always display at the top of the quote results. 4. Click "Settings" at the top of the page. Select "Quote Promotions" in the dropdown. 5. Click "Create New Quote Promotion" in the upper right-hand corner. On/Off Switch: Toggling this switch on and off will activate and deactivate a quote promotion. Schedule: This allows you to set a start and end date for an active quote promotion to appear in your mobile app's quote results. Display Order: If an agency has multiple quote promotions active, and multiple show up in the quote results, the "Display Order," will determine the priority in the list of quotes. Example: A quote promotion with an order set to 0 will appear above a promotion with its order set to 1. Carrier: This will determine which carrier is promoted in the quote results. Product: If you would like to promote all quotes for a carrier, this setting is not necessary. If you would only like to promote a specific product however, you can do so using this field. 7. After configuring your settings, click "Save" in the upper right-hand corner. 8. Congratulations! You have just set up a new quote promotion. 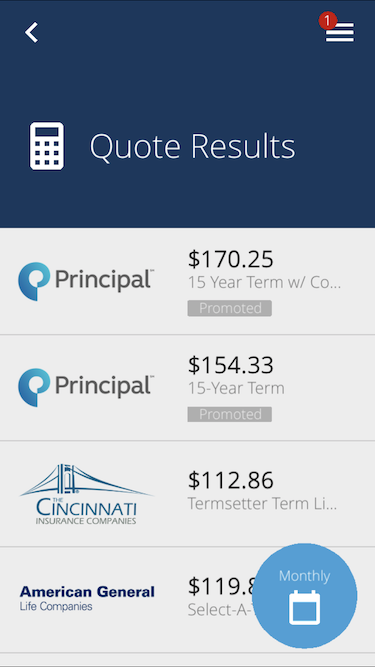 To view your promotion, run a quote and it will appear at the top of the results on your mobile app.